Are You Willing to Let God Have His Way in You? Even when you pray for God to do something with your life, do you really let God do as you’ve requested? Diane shares. “My soul faints with longing for Your salvation, but I have put my hope in Your Word. My eyes fail, looking for Your promise; I say, ‘When will you comfort me? '” (Psalm 119:81-82). As I was listening to music during my time with the Lord, the words of the song “God is” with Britt Nicole began to speak to me. (The video is below.) She spoke of feeling like she’d been in the same place forever–waiting and wondering why God had not intervened. It was like a prayer put to music, asking Him if He knew how great her struggle was; the tears that had fallen, that she felt she couldn’t hold it together much longer. I knew it was also my prayer to Him, and I just knew in that moment He was speaking to me through it. In the last year there has been many changes to my health, things beyond my control. Doctors unable to give a diagnosis to the continued and increased symptoms and issues. What is your soul longing for? What promises are unfulfilled? Have your eyes failed to see prayers answered, healing to come, hurts comforted, escape unavailable? Perhaps, like me, God is telling you to trust Him; to worship Him, right where you are today. What is the prayer your soul is longing for? May I pray with you, as we each allow God to Have His way in our lives and in our hearts? Prayer: Father, as we come together we ask You to hear our voices joined together. We humbly plead for Your strength, grace, and mercy as we face the challenges before us. Help us, Lord, to relinquish control and allow You to have You way, Your purpose in each of our lives. For we know, Lord, You always have our best in Your plan. We love You and praise You for who You are–our Creator and the salvation of our souls. Amen. Imagine God wants to have His way with you. If you were to write down the first three things He would choose to make that happen, what would they be? Filed Under: Coping Skills, Devotionals, Fear, Spiritually Struggling, What's New? 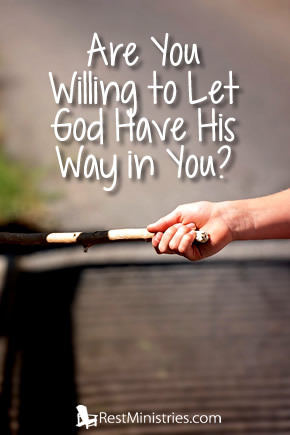 6 Responses to Are You Willing to Let God Have His Way in You? Diane, you spoke so deeply to my heart today! Thank you for opening your heart so sweetly to me/us! Thank you for being obedient to His calling. It seems like each time each time I reach a new quiet spot, a new plateau, I go through this all over again! He is quiet, there is no new marching orders, I move along in my illness and I become afraid. But He is right there, isn’t He? Diane – what words of comfort you share with us. I know any of those who read it will identify. We long to serve and honor God with all of our being. Answers to prayers that seemed delayed in our own natural eyes do not mean He has left us hanging, rather He is at work behind the scenes where we cannot see. It makes our faith and trust grow and more importantly, as you said in your praying, “Have your own way, Lord” we are committed to just that. We trust the way He chooses to work and know that it is because He trusts us that He wants all to work together for the good He alone ( at these times ) can see. Continuing prayers for you as you seek His time of revelation. You know how many are holding you close and He s holding you even closer. This is a beautiful illustration of how God does meet us in our times of need – maybe not with the answers we would like, but with the assurance that He’s still “having His way” in our lives.